I’m a big fan of Diners Drive-ins and Dives and often find myself watching re-runs of Guy Fieri on his road trip around the US, hunting down the best stateside diners at anywhere from roadside shacks to petrol stations. Hence when I heard the guys behind Bistrotheque (one of my favourite places in the East End) had launched a new pop-up venture serving contemporary American diner food at the old-school BP filling station north of King’s Cross, the concept was far too tempting and intriguing to resist. As you cross the bleak and destitute nothingness outside the filling station and make your way through the doors of what was formerly the kiosk, it’s like entering a different dimension altogether. Our waitress, sporting an immaculately white laboratory coat and a fabulous Macy Gray-esque afro soon ushered us to our table. 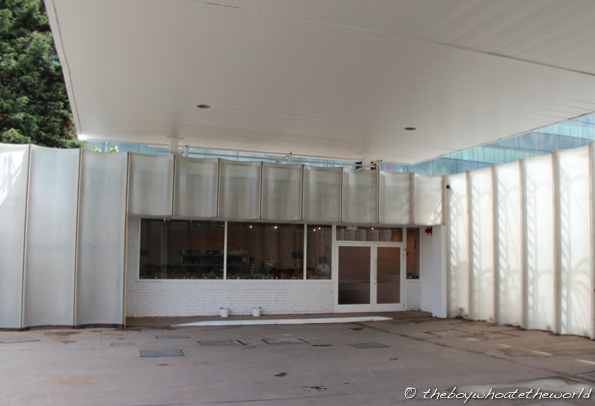 The imaginative refurb leaves no hint of the old petrol kiosk inside. 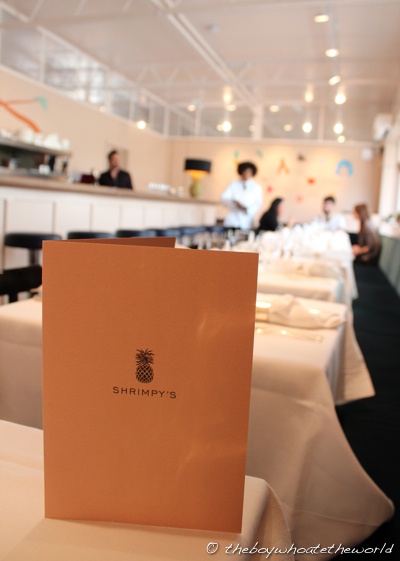 Custom made pineapple lampshades sit proudly on the dining counter top…. The table cloths are white and pristine… The silver of the salt & pepper shakers and cutlery still lustrous and gleaming. The caricatures and cheeky pop-art illustrations on the wall are a reminder however that despite the plush and smart interior, some fun and quirky diner grub awaits. As we were in a bit of a hurry, we skipped on starters and dived straight into mains… our eyes immediately transfixed on the Soft Shell Crab Burger and Fried Chicken dishes despite the slightly exorbitant £16 price tag that accompanied each of them. Sadly, neither dish really impressed. 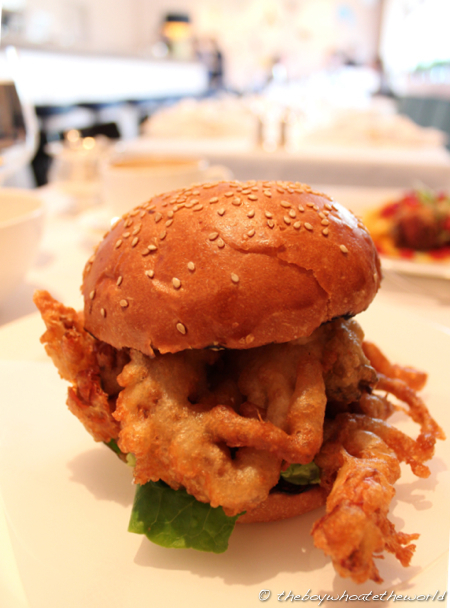 Soft Shell crab burger was a real let down. I just don’t think Soft Shell Crab and avocado were ever made for each other. The mushy, guacomole filling in the burger was a horrid wet blanket on what was otherwise a beautifully crisp, plump and meaty soft-shell crab. The batter went from crunchy to an inevitable soggy within minutes. What’s more, the thick, slightly dry burger bun didn’t really help matters either. 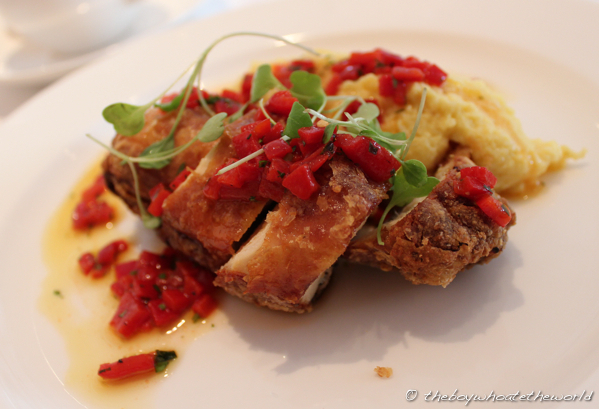 The Fried Chicken dish, despite the pretty plating was even more underwhelming. Given the princely sum we were paying, you would hope at least for something you could really sink your teeth into. What turned up though was a single, measly chicken breast fillet… cut into 4 pieces as if that would make it look larger… the batter, completely ordinary. What really disappointed though was the Polenta. Slightly stodgy and lacking seasoning, even the sweet red peppers and sweetcorn weren’t enough to lift it out of bleurghhh-land. I just wish they were a little more gung-ho with their flavours. I really wanted to like Shrimpy’s. Don’t get me wrong, the concept of the place is great and the service was friendly and sharp. But if you’re seriously going to charge your customers £16 for burgers and fried chicken, you gotta make sure the dishes are mind-blowingly good. In this case, we felt as if our hard-earned money was going towards subsidising the refurb and the swanky Ipads used to place our orders as opposed to the food itself. That’s easily the most expensive & underwhelming meal I’ll ever have at a filling station. Ever. Haha, I had the same 2 mains and reached the same verdict…. not good. Ute: Such a shame right! Had such high hopes for it and I seriously wanted to like it. Thanks for the review! As a student at CSM I was hoping that the Filling Station would be geared towards the student population as an alternative to our canteen and Eat St. Looks like I was completely wrong. £16 for that chicken is robbery! Ru: You are most welcome, thanks for stopping by. Yes, it’s the furthest thing from a budget option possible!!!! I’m Ele, and I’m on the eCommerce team at Square Meal. Whilst getting to know the Square Meal world and website, I’ve been looking at the input of bloggers, who link their personal blogs to restaurant pages on our website. On behalf of Square Meal, I want to say a big ‘thank-you’ for your loyalty. I’ve really enjoyed reading about your meals (good and bad!) and I particularly love the photos you’ve included. I know how valuable it is to Square Meal users to have easy access to other diners’ experiences, to help them choose a dining venue.